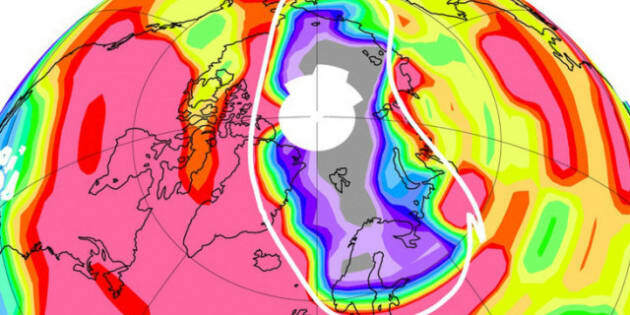 WASHINGTON - Scientists say an unprecedented ozone "hole" opened up above the Arctic last year, caused by an unusually prolonged period of extremely low temperatures in the stratosphere. A NASA-led study says the amount of ozone destroyed was comparable to that seen in some years in the Antarctic, where an ozone "hole" has formed each spring since the mid 1980s. Scientists from 19 institutions in nine countries, including Canada and the United States, were involved in the research. They found that at some altitudes, the cold period in the Arctic lasted more than 30 days longer in 2011 than in any previously studied Arctic winter, leading to the unprecedented ozone loss. This year's ozone loss occurred over an area considerably smaller than that of the Antarctic ozone holes. That's because the Arctic polar vortex, a persistent large-scale cyclone within which the ozone loss takes place, was about 40 per cent smaller than a typical Antarctic vortex. The stratospheric ozone layer, extending from about 15 to 35 kilometres above the surface, protects life on Earth from the sun's harmful ultraviolet rays, which can cause skin cancer and other medical conditions. "These particles were abundant in the Arctic until mid March 2011 - much later than usual - with average amounts at some altitudes similar to those observed in the Antarctic, and dramatically larger than the near-zero values seen in March in most Arctic winters," Poole said. The 1989 Montreal Protocol limits production of ozone-depleting substances. The study was published on Sunday online in the journal Nature.